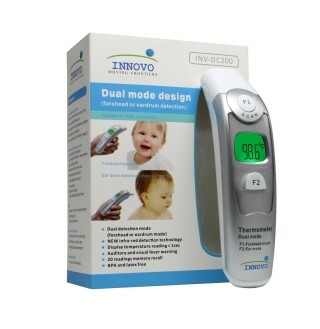 iProven Triple Mode Thermometer TMT-215 is intended to measure the body temperature of humans. 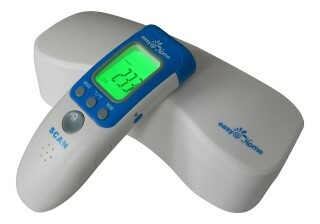 The ear measuring function can be used for babies who are a minimum of six months old. The forehead function can be used for all ages. 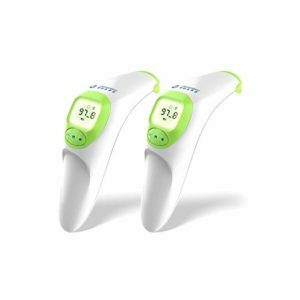 It measures the body temperature based on heat radiating from the eardrum or from the forehead. 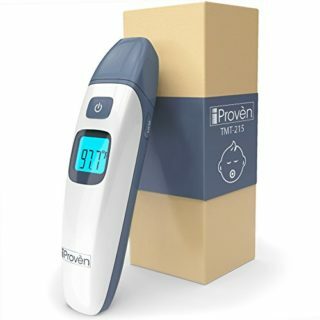 Although this thermometer has undergone extensive clinical tests and is considered safe and highly accurate, it is intended for non- professional home use only. The object mode shows you the temperature of your baby’s bottle and meal, or even their room and bed, in a second. 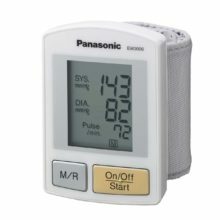 It can take temp using ear or forehead, and can also measure ambient temperature in a room. 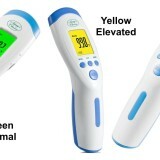 The intelligent fever indication lights up in green or red, showing you if your baby has a fever. You can switch between ˚C and ˚F. Instructions are easy to read and make setup simple. The cap covering the ear probe is a little difficult to remove. Firstly remove plastic tab by pulling it out of the battery compartment. 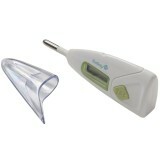 • 6 months and older: you can take regular ear measurements. • Press mode-button to select the mode you need. • The thermometer will save this mode for next use. Switch to headmode with mode-button. Swipe forehead in three seconds from temple to temple. 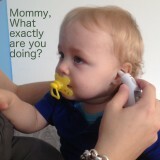 • Pull ear backward for babies 6-12 months. • Pull ear back & up for anyone older than 12 months. Aim right at the eardrum. Never force the probe into the ear canal, to prevent injuries. Switch to object mode with mode-button. Point & touch the object surface. Red 3 short beeps 86-95.7 Hypothermia Consult doctor immediately. Green 1 long beep 85.8-96.7 Decreased temperature Lower temperatures in the morning are perfectly normal. If you are feeling cold take a hot shower. 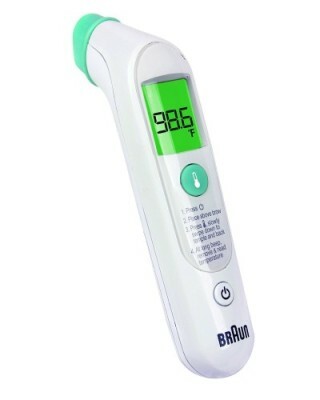 Green 1 long beep 96.8-99.6 Good temperature Your body temperature is fine. Red 3 short beeps 99.7-100.3 Increased temperature If you are not feeling well, get some rest. 1. Especially for the head mode, you will get the most accurate results when the thermometer and the user have been in the same room for 30 minutes. 2. Keep the sensor lens clean. Earwax and skin grease can influence the results. Always check before use. 3. 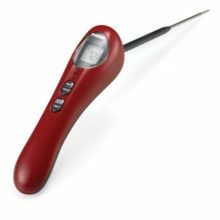 Your thermometer saves each measurement automatically. 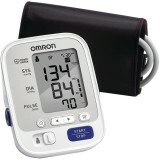 Press memory-button to view first stored measurement. Press memory-button again to go to next entry. 4. 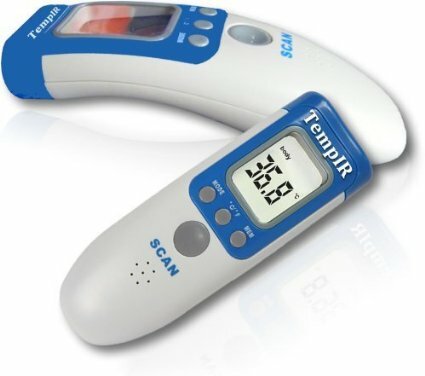 You can mute or un-mute your iProven TMT-215 thermometer with the mute-un-mute switch . 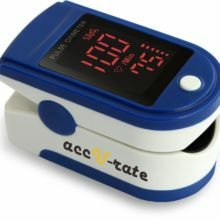 This can be handy if you want to take your child’s temperature while he/she is asleep. Press and hold the memory-button for more than 4 seconds. ºC or ºF are flashing. Press memory-button to switch between ˚C or ˚F. Let the thermometer switch off, the setting is saved automatically. 6. For more tips about your device, see backside. 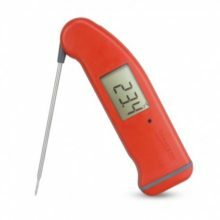 Regularly clean the thermometer probe with a damp cloth, moistened slightly with water. You can clean the lens of the probe with a cotton swab. 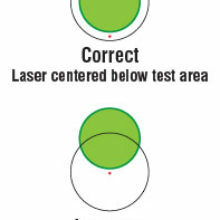 If you want to disinfect the sensor probe, use a disinfecting wipe or a cotton ball dampened with a disinfectant. You can prevent the sensor from getting stained by ensuring the ear canals are clean. Caution: This thermometer is not waterproof! Do not immerse or expose it to water or any other liquid other than using a slightly damp cloth. 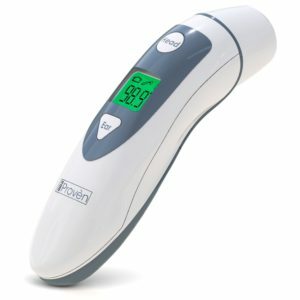 How should I store the iProven TMT-215 thermometer? 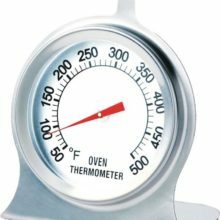 Store this thermometer at room temperature. 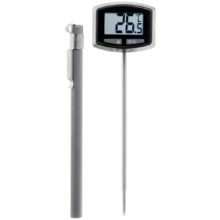 The most accurate temperature measurement is obtained when the thermometer and the user have both been exposed to the same ambient temperature for at least 30 minutes. 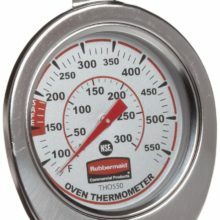 Always store this thermometer in the enclosed soft case to prevent it from collecting dust or being exposed to bacteria. If your thermometer will not be used for more than 90 days, we recommend you remove the batteries and store them separately. Do not expose the device to direct sunlight. 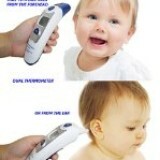 • The ear measuring function of this thermometer is not suitable for children under 6 months. For children younger than 6 months we recommend using the forehead mode or a rectal digital thermometer such as the iProvèn DT-R1221B. • This device is not intended to serve as a continuous monitoring device. • This device is not waterproof. Please keep it away from water or other liquids. • Make sure children do not use the device unsupervised. 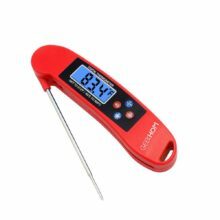 • Please do not use the product if the temperature sensor of the thermometer shows any sign of damage. Do not try to repair the product if it is damaged. Instead, please contact our customer support at www.iproven.com. 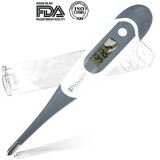 • The use of this thermometer is not intended to take the place of appropriate medical supervision. 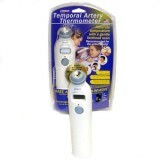 • iProven TMT-215 thermometer consists of high quality, precision-made parts. It is not designed to be impact- or shock-resistant. Avoid dropping the product or subjecting it to intense shock or vibration. 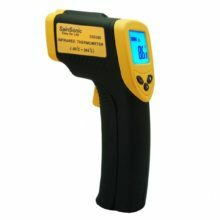 • Remove the batteries if the thermometer will not be used for more than three months.